The comfort zone is where Owen gets his mail delivered, but Other People’s Songs is at its most engaging when it steps just a bit outside. No matter who Mark Kozelek (he of Sun Kil Moon, and devout War on Drugs fan) decides to cover -- be it Modest Mouse, Husker Du, Low, or anyone else – the chosen song always comes out sounding more like his own than the actual artist’s. This is partly because Kozelek often doesn’t just recreate a song with different instrumentation or a change of tempo; he reconfigures the chords and melodies to the point where they would often be unrecognizable if not for his graciously keeping the lyrics intact. That’s just part of the Kozelek treatment. It is not meant to obscure the song beyond recognition just for the sake of it, but to provide a different way of listening to and interpreting the songwriter’s work. A similar fate comes to those who have been pulled into Owen’s unshakably pleasant orbit on Other People’s Songs. Mike Kinsella stays faithful to original structures, but the elements that characterize Owen’s many records – the cracking speak-sing quality of his voice, the warm acoustic guitar and nimble fingerpicking – are what most strongly unites these eight selections. Indeed, otherwise, it’s not exactly the most obvious collection. Other People’s Songs neither captures the complete spectrum of Kinsella’s influences, nor serves as a tribute to a distinct genre or theme. When Kinsella announced the impending release of the album on his website by stating that he “recorded some covers of other people’s songs this year”, that might be about as far as can be read in to it. If there were a dartboard with a kind of vague notional punk-alternative bullseye, the majority of these songs might have been chosen by landing tosses around it. 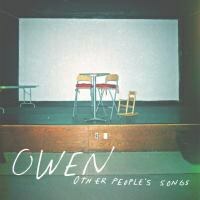 This is felt most heavily with side B’s final trio of ‘80s LA punks All, Against Me!, and pop punk crooners the Smoking Popes, but earlier in the album Owen also tackles the Promise Ring and Lungfish. The Blake Babies song isn’t exactly punk per se, but it’s a close call if you weigh in the twisted spirit of the lyrics to “Girl in a Box”, which then pretty much leaves the covers of Depeche Mode and Mojave 3 to prove that the route to Kinsella’s heart isn’t only led by aggressive distorted guitars. Considering how he has previously expressed a fondness for the Sundays, in one interview even referring to them as a favorite band, it feels like a missed opportunity that Other People’s Songs doesn’t include a cut from Reading, Writing and Arithmetic (“A Certain Someone” would have been a prime candidate). For those who are either new to these songs, or are familiar but were never much for studying liner notes, the clear enunciation of Kinsella’s singing style does provide the bonus of removing any guesswork as to the lyrics. Davey von Bohlen had a tendency to obscure his vocals on the Promise Ring’s first two albums, which makes it particularly rewarding to hear the sweetly impressionistic lines from “Forget Me” (“Between one June and September / You’re all I remember / But I’m a lantern / My head a moon / I married a room”) given their space on Owen’s breezy countrified take. His aversion to raising his voice means that Against Me! Fans attached to the drama of Laura Jane Grace’s delivery would probably find this “Borne of the FM Waves of the Heart” lacking fire, but it transcends being merely a solid acoustic cover of a big rock song. Though the comfort zone is where Owen primarily operates, it is when Other People’s Songs stretches the furthest – as it also does with its fragile declawing of Lungfish’s “Descender” – that it becomes the most rewarding.